Two tripels, one brewed in the US (Texas) and the other in Belgium. The Westmalle Trappist Brewery made tripels popular and the designation sets their 9.5% ABV Tripel apart from their 7% ABV Dubbel (double) and their 4.8% “single” beer (called Extra, and not generally commercially available). 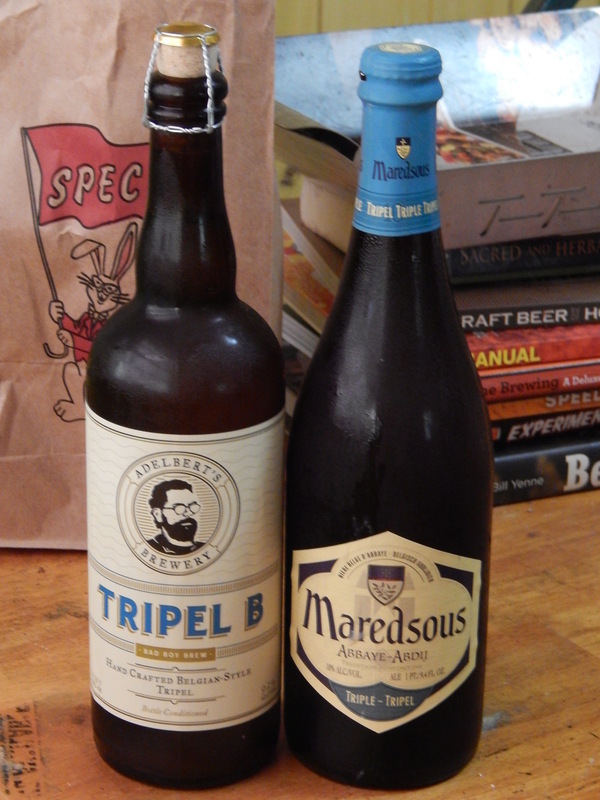 In addition to being an indication of strength, by convention, tripel always designates a pale beer while dubbels are always dark beers. There are several challenges to brewing a tripel, and this makes it a great brewing experience for homebrewers used to brewing English-style ales who are looking for something new to try. Tripel is a strong ale, but it doesn’t taste like a strong ale. There are three primary reasons for this. First of all, the beer is relatively dry, so it doesn’t have that sweet character that usually accompanies stronger beers. Secondly, it’s relatively highly hopped. The bitterness further diminishes any perception of sweetness. Finally, it’s highly carbonated. The prickly fizziness of the beer makes it more quaffable. Belgian strong golden ales follow the same pattern, but are generally even drier and fizzier than tripels. Tripel is not an intensely flavored beer. It doesn’t resemble a nearly flavorless fizzy yellow lager, but it isn’t bursting with flavor like a bourbon barrel-aged imperial stout, either. The hallmark of a great tripel is not a large amount of flavor, but a beer thats characters are well-balanced in every respect. The flavor of the malt, flavor of the hops, “spicy” yeast-derived characters, relatively light body of the beer, and the effervescence of the carbonation all come together to make a wonderful beer. This can make the beer challenging to brew, because two out of three isn’t going to cut it. (Sorry, Meatloaf.) You need the beer to be dry, hoppy, and fizzy. A good tripel showcases the flavor and aroma of Pilsner malt, offset by bitterness from noble hops. The relative light body and high level of carbonation gives the beer a “bite” that balances the sweet flavor of Pilsner malt and produces a very well-balanced beer. The aroma is a blend of malt, a small amount of hops, and “spicy” phenolic fermentation products. Westmalle’s water is very hard, but other Belgian breweries brew similar beers with soft water. As a homebrewer, simply adjust your water so that you can brew a pale beer with it. In most cases, you’ll probably want carbonate ions less than 50 ppm and calcium ions at 100 ppm or higher. If you need to add calcium, a 1:1 to 1:2 blend of calcium chloride and gypsum should do well — you don’t need IPA-like amounts of sulfate in your water to accentuate the hops. Treat your water to remove chloramines, of course, and give the final treated water a taste to see that it tastes good — and then you’re ready to brew.